Yemen is a fairly large country located in the very Southwest of the Arabian Peninsula, very close to Africa. Until 1990 it used to be two separate countries, North Yemen and South Yemen. The territory also includes over 200 islands, many of them volcanic, including the Socotra archipelago whose biodiversity has made it a UNESCO natural heritage site. Yemen is a Muslim country, but also largely a tribal society with some tribes having a caste system. During the 2011 Arab Spring there was a revolution in Yemen, like in many other nearby countries. Yemen is one of the poorest countries in the Arab world, because it has smaller oil reserves than the neighbouring countries. The oil is still economically very important, which might soon bring a catastrophe as they are estimated to be depleted in 2017. Seafood, mango and cotton also important. Yemen struggles with huge population growth, large unemployment, lack of healthcare and lack of clean water. Football is very popular and some tribes practice camel jumping (people jump, not the camels). Because Yemen used to be so isolated, the cuisine is quite different from the rest of the Middle East, with only slight Ottoman (Turkish) and Indian influences. It is currently very popular in other Arabic countries. Chicken, lamb and fish are popular, but dairy not so much, though buttermilk is consumed by some tribes. The national dish is saltah, a meat stew with fenugreek, skhug chili sauce and herbs, which may be eaten with rice, potatoes, scrambled eggs and vegetables. There are many traditional breads baked in tandoori oven. Hawayig is a spice blend containing aniseed, fennel seed, ginger, and cardamom. Both coffee and tea are popular, the latter often flavoured with cardamom, cloves and mint. Qishr is another common drink made with coffee husks and ginger. Charoset is a traditional Yemenite holiday candy, I created my recipe by mixing two recipes: this and another one I misplaced and can’t find anymore. It is very similar to the common fruit and nut bars that everyone who has ever been into raw food has made, except with the addition of white wine and some less common spices. If you want to keep this fully raw, you could substitute for a little lemon juice, perhaps some apple juice, for the wine (or you could blend a few grapes, but it might adversely affect how long they keep). I was surprised by how good the result was: the spices, lemon zest and wine combine to accent the figs (which are the only fruit you clearly taste, IMO) in a pleasant and quite sophisticated way. I also served them to a TV producer who was interviewing me who had seconds. 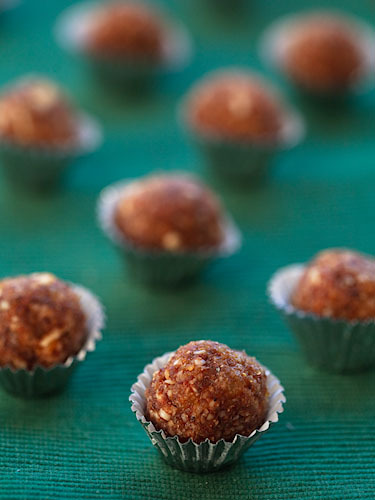 This recipe makes about 25 small balls, depending how large you roll them, of course. It’s a fine amount for eating by yourself or with family (not sure if kids would like these, hard to say), but if you want to serve them at a party or make for presents you should probably double the recipe. I don’t know how long they keep – normally nut and fruit bars keep pretty well in room temperature, but the wine makes them moister so if you are not eating them in a few days, I have stored mine in the fridge and they’re probably fine for at least three weeks. Soak the dried fruit in the white wine until absorbed (if some fruit are a lot drier than the others, only soak them). Grind the nuts fairly fine in a blender or food processor (don’t use a hand blender). Add all the other ingredients and process until fairly smooth (you probably have to mix with a spoon every now and then). Refrigerate for an hour. Shape into balls. Roll in sesame seeds (I had run out). This entry was written on December 22nd, 2012 by Maija Haavisto and filed under Desserts and sweets, Middle East. Jostain syystä kommenttini tähän postaukseen ei rekisteröitynyt tänne.Piti vähän korjata tuota,Charoset kun on hepreaa ja charoset tahna,jossa juuri on noita pallosten aineksia,on sellaista mitä tarjotaan aina juutalaisen pääsiäisen aterialla. Mutta tuo taitaa olla jemenin juutalaisten versio siitä.